On our first day at the camp we will be visiting the Melbourne Zoo. 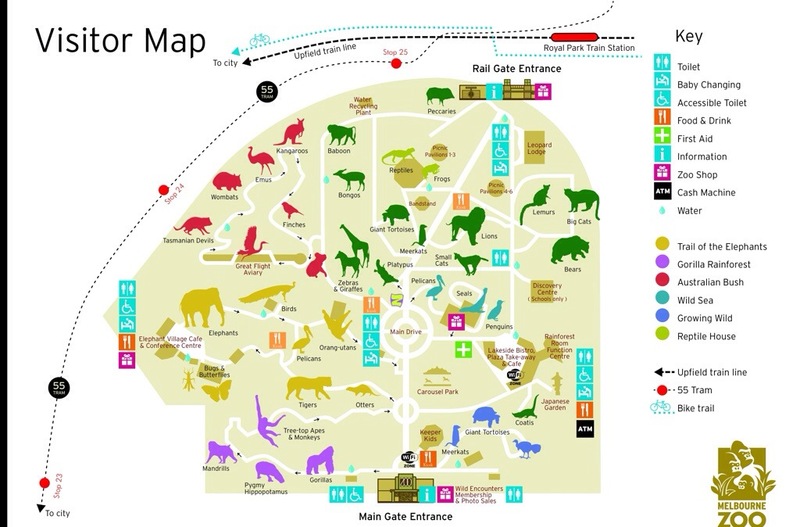 Use the map to learn more about the zoo and answer the questions/tasks in detail. – Name three animals that you would most want to see. Explain why you would like to see these three animals. – Use the key and the map to write down how many there are of the following. – What are two animals that are close to the tigers? – If we enter at the main entrance and turn left, what would be the first animal we would see? – Name four Australian animals that are at the zoo? – Name three African animals that are at the zoo? – What is the name of the cafe near the bugs and butterflies? – What number tram stop do you think we would use? I would like to see the tigers and the lions and the deer because they are cool animals and I like them and I think other people will like them to. When we go to the zoo I want to see the Gorillas, Mandrills and Tree top Apes and Monkeys because I like looking at each of them and they are part of the ape family. There are seven toilets in the whole zoo. There is one first aid in the whole zoo. There are four zoo shops in the whole zoo. There is one ATM in the whole zoo. The two animals that are close to the tigers are otters and pelicans. The first animal we would see after turning left at the main entrance is the Gorillas. The four Australian animals that are at the zoo are Kangaroos, Koalas, Tasmanian devils and Wombats. The three African animals that are at the zoo are Lions, Zebras and Giraffes. The name of the café near the bugs and butterflies in the elephant village café and conference centre. The tram stop that I think we will get off at is stop 23. –	There is a total of seven toilets at the zoo! –	There is only 1 first aid in the Melbourne zoo! –	There is also 4 zoo shops and 1 ATM. –	The two animals that are close to the tigers are otters and pelicans. –	The first animal you would see after turning left from the main entrance would be the gorillas. –	Four Australian animals at the zoo are kangaroos, finches, emus and wombats. –	Three African animals at the zoo are, lions, zebras and giraffes. –	The name of the restaurant. Near the bugs and butterflies is elephant village café. –	The tram stop I think we would use would be stop 25. –	3 animals I would like to see would be the tree-top apes and monkeys, seals and the great fight aviary. I would like to see these animals because they seem very interesting and I want to learn more about them! 1. Meerkats: I choose this animal because I think the meerkats are cute and interesting to see how there life is like. 2. Tigers/Snow leopards: I choose this animal because they are my favourite animals and I want to learn more about them. 3. Kangaroos: I choose this animal because I want to see if the kangaroo’s captivity has a different animal living with them. There are 7 toilets, 1 first aid, 4 zoo shops and 1 ATM in the Melbourne zoo. The two closest animals near the tigers are the otters and pelicans. If we walked through the entrance the first animal we would see is the peccaries. The 4 Australian animals at the zoo would be kangaroo, emu, Tassie devil and koalas. The 3 African animals at the zoo would be Elephants, Giraffes and Lions. The café near the butterflies and bugs is called Elephant Village Café & conference centre. The number of the tram stop we would have to stop at is stop 25. I would like to the lions the Bear and monkeys. I would like to see those animals because I like those animals are amazing! There is 1 first aid. There are 4 zoo shops. The 2 animals that are close to the lion are small cats and meerkats. If we turned left as soon as walked in we would see the gorillas. The four animals in the Australian section are wombat, kangaroo , Tasmanian devil and koala. The three animals in Africa are tigers, elephant and the pelican. The café that is closest to the bugs and butterflies is Elephant Village Café. I think that the tram stop number is 25. Questions to the zoo keepers. Why are zoos called zoos? like why can’t zoos be called the land of animals? Can you have snakes in their own inclosher at the zoo? 1 I want to see the meerkats because they look like a type of monkey. 2 I want to see the water recycling plant because it recycles water. 3 I also want to see the giant tortoise because they are going to be bigger than normal turtles. There are 7 toilets at the zoo. There is 1 first aid room at the zoo. There are 4 zoo shops at the zoo. There is 1 ATM at the zoo. The otters and the pelicans. We would see the gorillas at the zoo. The name of the café is the Elephants village café. I would love to see the seals, the penguins and the koalas because they are my favourite animals and they’re so adorable. If we went through the main entrence and turned left what will be the first animal to see? What number tram stop do you think we will use? I would like to see the Tasmanian devils, wombats and kangaroos because they are all Australian animals that I like. There are 7 toilets in the zoo. There is 1 first aid in the zoo. There are 4 zoo shops in the zoo. There is 1 ATM in the zoo. If you turn left from the main entrance we will end up at the gorillas. The 3 African animals that I have chosen are big cats, meerkats and bongos. The tram stop that I think will get off at is number 25. Toilet there is seven toilets throughout the whole zoo. First aid there is only one first aid place. Zoo shops there are four zoo shops. The three most type of animals I would want to see at the zoo is koalas, monkeys and gorillas. I would like to see this animals because there type of my favourite animals. The three animals that I know come from African is elephants tiger lions and monkeys giraffe. And threes Australia animals that I know from Australia is koalas and emus and kangaroos. The number that we are going to stop on is number 25. There are seven toilets throughout the whole zoo. There is only one first-aid place at the zoo. There are four zoo shops. There is only 1 ATM in the zoo. The three types of animals that I want to see at the zoo are Gorillas, Koalas and Monkeys. I would like to see the Gorillas because I find them really funny and they seem nice to visit. I would love to see Koalas because they are my favourite animal and they are really amazing. I want to see Monkeys because I would like to see if they are as smart as humans and if they are funny type of animals. The three animals that I know that come from Africa in the Zoo are Elephants, Giraffe and Monkeys. The three Australian animals that I know come from Australia in the zoo are Koala’s, Kangaroos and Wombats. I would love to see the butterflies because they are my favourite animals. I would love to see the penguins because they are really cool and funny. I want to see a tiger, gorilla, lion and a bear because they are very interesting to see and how they behave. Name four Australian animals that are in the zoo? Emu, kangaroo, Tasmanian devil, and a wombat. 5/6C, you need to complete this task!